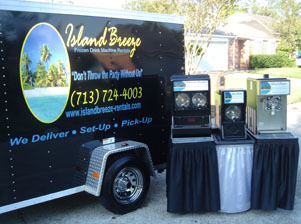 Island Breeze Frozen Drink Machine Rentals makes the perfect choice for your next party or event in the Greater Houston area. We supply our customers with top of the line commercial grade frozen drink machines and NOT plastic bowl frozen drink machines. Plastic Bowl frozen drink machines rent for less but they take 2 -3 hours to freeze and DON'T work outside in the heat when the temperature is 80 degrees or more. Refills can take up 2 hours with the plastic bowl machines. Our frozen drink machines are easy to use, refillable, extremely reliable, and tested before every rental. Our frozen drink machines freeze the mix so that no ice is needed and can freeze virgin mix within 30 minutes (our single units indoors)! Our frozen drink machines make smooth margaritas or any other frozen drink. Margaritas made in a blender can't compare. Make perfect smooth margaritas or any other frozen drink every time! We only use premium mixes and have over 40 flavors to choose from. Use our Ultra Premium Top Shelf Lime Margarita mix made with real lime juice for the best tasting margarita. Click on our Mix page for some awesome recipes. Renting a Frozen Drink Machine aka Margarita Machine is going to make your party or event a HIT! Common occasions for our rentals include birthdays, pool parties, backyard barbecues, housewarming parties, weddings, anniversaries, engagement parties, rehearsal parties, quinceaneras, retirement parties, holiday parties, crawfish boils, block parties, charity events, trade shows, conventions, graduation parties, baby showers, bachelorette parties, bridal showers, fundraisers, Super Bowl parties, major sporting events, church festivals, rodeo cook-offs, school events, reunions, employee appreciation events, and corporate events. Island Breeze Frozen Drink Machine Rentals has been serving Houston businesses, schools, churches, and customers since 2005. We have GREAT reviews on Yahoo, Google, Yelp, and YP.com. Read our customer's testimonials and submit your own after the rental. We provide excellent service, quality commercial working rental equipment, minimal delivery fees and competitive rates. Why shop anywhere else? Our frozen drink machine prices are very competitive and we offer delivery, set-up, and pick-up. Island Breeze rents Soft Serve Ice Cream Machines and other Party Rental Equipment. We rent Tents, Canopies, Tables, Chairs, Outdoor Fans, Outdoor A/C Blowers, Outdoor Patio Heaters, Ice Cream Machines, Snow Cone Machines, Shaved Ice Machines, Popcorn Machines, Cotton Candy Machines, Nacho Cheese Dispensers, Hot Dog Carts, Chocolate Fountains, and Generators. We are based in West Houston and service West of Downtown Houston including KATY, SUGAR LAND, Brookshire, Hockley, Fulshear, Sealy, Bellaire, Stafford, Missouri City, Richmond, Rosenberg, CYPRESS, and Tomball TX. We may provide services in your area for large orders if your area is NOT listed. We can accommodate parties from 5 to 5000 guests with our frozen drink machines. We bring the party to your location. Reserve now to rent a margarita machine / frozen drink machine or party rentals.